President Donald Trump’s 2020 budget proposal is delivered to the House Budget Committee on Capitol Hill Monday. Presidential budgets tend to be seen as aspirational blueprints, rarely becoming enacted policy, and Trump’s proposal for the new fiscal year, which begins Oct. 1, sets up a showdown with Congress over priorities, including his push for $8.6 billion to build the U.S-Mexico border wall. 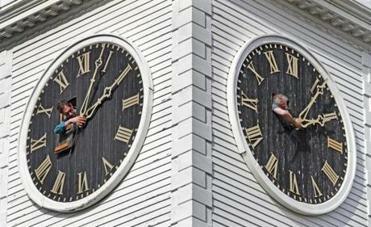 More than two dozen states are considering measures to avoid the twice-yearly clock change. Titled ‘‘A Budget for a Better America: Promises Kept. Taxpayers First,’’ Trump’s proposal ‘‘embodies fiscal responsibility,’’ said Russ Vought, the acting director of the Office of Management and Budget. The budget calls the approach ‘‘MAGAnomics,’’ after the president’s ‘‘Make America Great Again’’ campaign slogan. Maya MacGuineas, president of the Committee for a Responsible Federal Budget, said Trump ‘‘relies on far too many accounting gimmicks and fantasy assumptions and puts forward far too few actual solutions.’’ She warned the debt load will lead to slower income growth and stalled opportunities for Americans. Trump’s budget proposes increasing defense spending to $750 billion — and building the new Space Force as a military branch — while reducing nondefense accounts by 5 percent, with cuts recommended to economic safety-net programs used by many Americans. The $2.7 trillion in proposed spending cuts over the decade is higher than any administration in history, they say. Trump’s budget would re-open two health care battles he lost in his first year in office: repealing ‘‘Obamacare’’ and limiting future federal spending on Medicaid for low-income people. Under the budget, both programs would be turned over to the states starting in 2021. The Democratic chairman of the House Budget Committee, Rep. John Yarmuth of Kentucky, called the proposed cuts to essential services ‘‘dangerous.’’ He said Trump added nearly $2 trillion to deficits with the GOP’s ‘‘tax cuts for the wealthy and large corporations, and now it appears his budget asks the American people to pay the price,’’ the Democrat said. While pushing down spending in some areas, including the Environmental Protection Agency, the proposal will seek to increase funding in others to align with the president’s priorities, according to one official. The budget provides $291 million to ‘‘defeat the HIV/AIDS epidemic’’ with hopes of eliminating 90 percent of new infections within 10 years. It would also increase resources to fight the opioid epidemic with money for prevention, treatment, research and recovery, the administration said. The proposal will also include $1 billion for a child care fund that would seek to improve access to care for underserved populations, a White House official confirmed. The one-time allocation is championed by the president’s daughter Ivanka Trump, who has focused on economic advancement for women in her role as a White House adviser. White House economic adviser Larry Kudlow said Trump’s budget ‘‘points a steady glide path’’ toward lower spending and borrowing as a share of the nation’s economy. He also told ‘‘Fox News Sunday’’ there was no reason to ‘‘obsess’’ about deficits, and expressed confidence that economic growth would top 3 percent in 2019 and beyond. Others have predicted lower growth. In seeking $8.6 billion for more than 300 miles of new border wall, the budget request would more than double the $8.1 billion already potentially available to the president for the wall after he declared a national emergency at the border last month in order to circumvent Congress — although there’s no guarantee he'll be able to use that money if he faces a legal challenge, as is expected. Along with border wall money, the proposed budget will also increase funding to increase the ‘‘manpower’’ of Immigration and Customs Enforcement officers and Customs and Border Patrol at a time when many Democrats are calling for cuts — or even the elimination — of those areas. The budget also proposes policy changes to end sanctuary cities, the administration said. The budget arrives as the Senate readies to vote this week to terminate Trump’s national emergency declaration. The Democratic-led House already did so, and a handful of Republican senators, uneasy over what they see as an overreach of executive power, are expected to join Senate Democrats in following suit. Congress appears to have enough votes to reject Trump’s declaration but not enough to overturn a veto. The standoff over the wall led to a 35-day partial government shutdown, the longest in U.S. history. Associated Press writers Jill Colvin in Palm Beach, Florida, and Andrew Taylor in Washington contributed to this report.